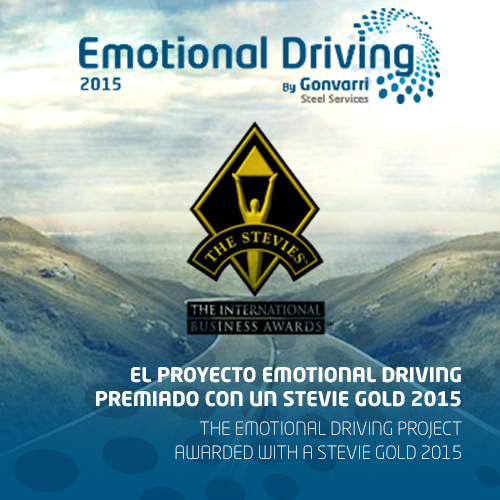 International Business Awards have awarded the Emotional Driving Project, by Gonvarri Steel Services, as the best Internal Communications project in 2015. Emotional Driving was created from the safety road concept by Gonvarri, developed by and for its employees, in order to motivate them to drive safely, combining the emotional and rational level. Emotional Driving has been developed from the Safety Road Sessions, collaborative challenges and from an online learning session, which had an excellent employee involvement from the first day, held at the Madrid’s plant in December, 2014. Afterwards there has also been held four editions in Asturias, Navarra, Barcelona and Galicia. In total, more than 1,500 people have already joined the project. To know more about it, visit its microsite here. The Stevie Awards recognize the achievements and contributions of organizations worldwide and has become one of the world’s most coveted prizes in the Communications sector. The awards ceremony took place in Toronto, Canada, last October.